Did you know that baby boomers shop online just as frequently as younger generations? It should come as no surprise that boomers are increasingly relying on digital tools in every aspect of their lives, including health care. 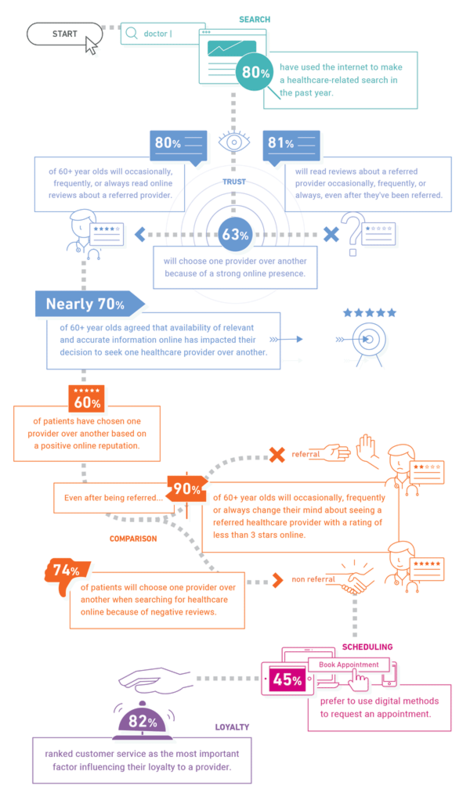 In the recently published Customer Experience Trends in Healthcare 2018 Report, Doctor.com surveyed more than 1,700 patients—in partnership with SurveyMonkey Audience—to reveal that all generations, especially boomers, are using online tools at almost every step of their health care journey—from research and comparison, to choosing a doctor and booking an appointment. Boomers are known for their generous spending habits, boasting the highest disposable income among all generations. But with 3 million entering retirement every year, the 60+ crowd is becoming more discerning about their finances, especially when it comes to costly health care decisions. The Customer Experience Trends report reveals that a word-of-mouth referral is no longer enough to convince a boomer to book an appointment. Here are four essential statistics and takeaways that will help your practice attract and win the loyalty of this population. When it comes to deciding on a health care provider, nearly 70 percent of boomers say that the availability of relevant and accurate information online will influence whether they choose to see a particular doctor. In fact, two out of three will decide not to see a provider who has incomplete information online. Key takeaway: Ensure that your practice is listed on all of the major websites that patients use to search for vein doctors. Once you’ve identified these sites, make sure that your information is accurate and up to date. Include helpful information such as accepted insurance, office hours, specific services, treatments, etc. If your practice is not listed across the web, Google and Yelp are a great place to start. Eighty percent of boomers will read online reviews about a provider even after they’ve been referred. In fact, 90 percent of boomers will decide not to see a health care provider they’ve been referred to if they see a rating of three stars or less online. Key takeaway: Make it as easy as possible for patients to leave you feedback. One way to do so is to set up profiles on Google, Yelp, Healthgrades and other popular patient review sites. The key is to make your reviews easy to find and read so patients are sure to make that journey from referral, to online validation, and ultimately through your front door. If you don’t have an online reputation strategy, fear not. An easy way to get started is to set up a practice profile on Google, Yelp, Healthgrades and Vitals—all of which are the most popular health care review sites. Feel free to link to these sites from your email signature, social media channels, and website so patients can leave feedback easily. Don’t be afraid of negative reviews, especially if you’re committed to delivering the best care to your patients. Health care providers on Yelp have an average rating of four stars, proving that positivity tends to outweigh negativity. It’s not just millennials that enjoy the convenience of mobile apps and tools. Sixty-two percent of boomers prefer text or email appointment reminders, while less than one-third prefer phone call reminders. In fact, 60 percent say that “ease of appointment booking” is a major factor in leaving a five-star rating for a practice. Key takeaway: Boost new appointments by offering easy online scheduling options and text or email appointment reminders. For busy, multitasking boomers, digital scheduling tools and reminders are less disruptive and much more convenient than making a phone call or receiving voicemail. Eighty-four percent of boomers say that quality customer service is key to their loyalty to a health care provider, assuming they are receiving quality care. Key takeaway: Ensure your patient has a great experience at every touchpoint, from scheduling an appointment, interacting with your front office, as well as the post-care experience. There should also be a seamless billing process, helpful follow-up reminders, etc. In fact, most online reviews stem from good or bad customer service experiences. In sum, in order for your practice to thrive not only among the boomer crowd, but among generations to come, you need to take control of your online presence and reputation. 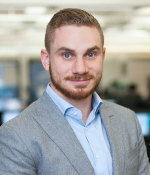 As CEO, Andrei guides strategy and oversees daily operations at Doctor.com, the leading customer experience platform purpose-built for the health care industry. He has helmed the company from inception and is committed to helping health care organizations deliver a better customer experience at every step of the patient journey.